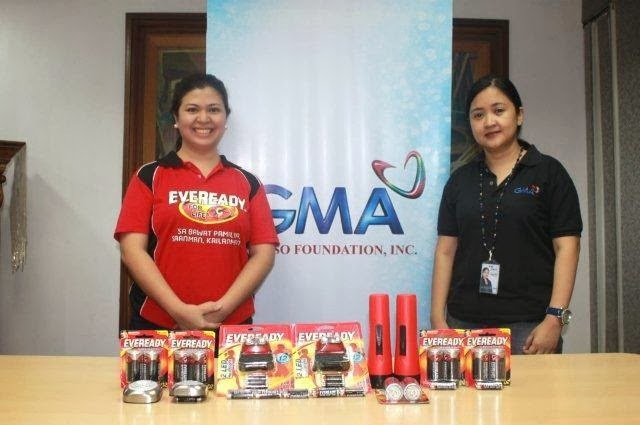 Eveready announces its partnership with GMA 7 Kapuso Foundation in the rehabilitation efforts and rebuilding of the lives of the affected families of typhoon Yolanda, as they donated flashlights and batteries. “Eveready believes in the Filipino resiliency and we hope that our products will give hope to the people affected by Typhoon as they start to rebuild their lives. In our own little way, we want to know the people of Tacloban, Leyte and other places affected by Yolanda that Eveready will be here to support them” said Jojo Emata, Brand Manager of Everady. Photo shows Jojo Emata and Marivic Calixto, Operations Manager of GMA Kapuso Foundation during a simple turnover ceremony. Relief efforts for victims of Typhoon Yolanda are still on-going. Let's still do what we can to help! This would be a big help for the victims of typhoon Yolanda most of all to those na nangangapa pa rin because wala pa ring electricity through out their area. I just hope na makatanggap ang karamihan or lahat na para wala ng lamangan at agawan . It's good to here that there are a lot of companies who are aware and willing to help para sa kapwa Filipino nila. I wish na sooner or later Tacloban, Palo and other places in Leyte will rise again . Nice naman. You can really see the effort of everybody (institutions, private individuals, other countries) to help people who were faced with a major calamity. My only wish is that at least our government improves. Minsan kasi nakakahiya na rin yung mga feedbacks against our government. You don't know who to believe anymore. Others are even taking advantage or relief goods meant to help these people. God bless Eveready! I will continue to support and buy your products so that you can help more of our fellow Filipinos in need. Its really good to see Filipinos helping each other in every possible way they can just to ease the burden their fellow Filipinos feel. At times like this, we really see people being united just to help. We may not know one another, we may not see each and everyone who was badly affected by the typhoon, but I believe its the heart of every Filipinos that connects us to one another. Thank you Eveready for always being so ever ready to help! haha! But, seriously thanks! Thank you also to GMA7 for always having the compassion and heart of reaching out to Filipinos. I just hope that every company is like Eveready, always present in every calamity to lend their hands! I feel glad na sa kabila nang nangyari unos sa phillipines eh marami tlaga yung handang tumulong.. Me i actually help also to our fellow people na naapektuhan nang bagyo. Nagdonate kami nang mga damit namin and other things needed for living. Sana in a year 2014 mapalitan naman nang swerte puro goodvibes and positive para naman ma compensate yung bad luck na nang yari sa phillipines. Sa sobrang dami nang environmental disaster e kotang kota na. Hehe..